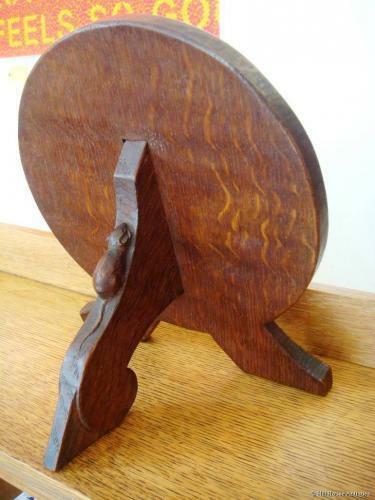 An extremely rare one-off privately commissioned piece, in the form of an adzed oak circular frame with stylish shaped easel, made by Robert "Mouseman" Thompson himself, housing a circular bronze portrait of his good friend, the Quaker, Marion Edmunsen. Sculpted by their mutual friend, noted Austrian born sculptor, Josef Heu; signed and dated for 1940. Excellent provenance, having come directly by family descent. A rare piece with a fascinating history behind it. Approx 9.5" high, and 8.5" diameter of the circular frame. By family repute, Marion Edmunsen was an extremely feisty and independently minded woman, who would not take no for an answer! Being a Quaker and conscientous objector, she was also renowned for helping feed prisoners of war near where she lived in Boltby, Yorks., for which she was apparently later imprisoned. Aside from raising four children herself after being widowed, she was also a breeder of Scottie dogs. She personally knew " The Mouseman", having grown up in the same Yorkshire village and accompanied him on walks. She came from a very affluent background in N. Yorks and apparently may well have helped the Mouseman financially in his early formative years. She commissioned many pieces from him. She was apparently also awarded the City Keys in Slovenia for her previous help with POW`s. Josef Heu (1876-1952) was born in Marburg an der Drau (Slovenia which was then part of Austro- Hungarian empire) and died in Ampleforth, Yorkshire. He was a p ainter, sculptor, teacher and indeed Professor at Vienna University of Applied Arts up to 1938. He married the daughter of the General Director of the Vienna Opera House with whom he had two sons. His wife and sons travelled ahead to England 1938, upon which he followed in 1939. There they were given a home by the monks at Ampleforth (and from there the Mouseman connection) and later lived at nearby Coxwold. Some of his work can be found at St Aidan’s Church in Harehills, Leeds, home of the famous Brangwyn mosaic; a ceramic plaque of the Last Supper. St Aidan’s already holds two works by Heu – a large statue in wood of Mary presenting the Christ Child to the world, known as The Redeemer, and a set of 14 Stations of the Cross. The Redeemer statue carved in a single piece of wood given to him by Robert (Mouseman) Thompson.